Readers looking for gritty crime can always find their fix on the mean (fictional) streets of Glasgow. 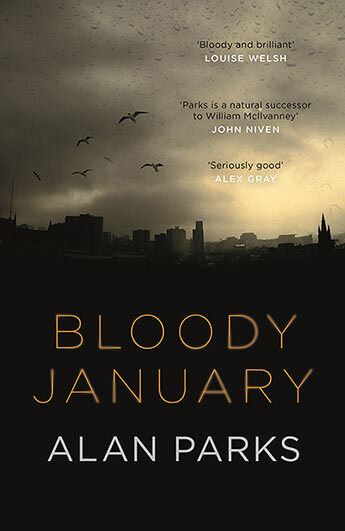 To make things a little grittier, Alan Parks, sets his debut novel Bloody January in 1973. Drugs and criminal gangs are rife, most of the police (sorry, polis) are on the take, and while there are plenty of shady no-go areas in town the whiff of development is in the air. Bloody January has an intriguing open. A prisoner with a long record asks to meet with Detective McCoy to warn him that a young woman will be killed. McCoy only half believes the tale and when he does follow up he is too late. The woman is shot, her attacker turns the gun on himself and the informant is killed in the prison. This book is not called Bloody January for nothing. The rest is what can only be described as corrupt police procedural where all roads lead to the ultra-rich and untouchable Dunlop family with whom McCoy has had run-ins in the past. McCoy himself is a complex character but one with most of the attributes readers have come to expect from Scottish crime. He has a damaging history, having been brought up in a boys home, relies heavily on drink and drugs to get him through the day, has a soft spot for a drug-addicted prostitute and is constantly getting beaten up for various reasons. But he is, despite all of his flaws and compromises, a good detective and willing to take some hits to see justice done. Bloody January does manage to convey a good sense of a cold, grimy Glasgow in the early seventies. McCoy and his wide eyed intern Wattie are an effective way into both the story and the milieu. And while Parks hits plenty of well worn plot beats and crime tropes, the plot rattles along to a suitably violent conclusion.